Andrée Borrel was born in France on 18th November, 1919. The daughter of working-class parents, she grew up on the outskirts of Paris. At fourteen she left school to become a dressmaker. In 1933 she moved to Paris where she found work as a shop assistant in a bakery, the Boulangerie Pujo. Two years later she moved to a shop called the Bazar d'Amsterdam. On the outbreak of the Second World War Borrel moved with her mother to Toulon on the Mediterranean coast. After training with the Red Cross she joined the Association des Dames de France and worked in Beaucaire treating wounded soldiers of the French Army. After France surrendered Borrel and her friend, Maurice Dufour, joined the French Resistance. They established a villa outside Perpignan close to the Spanish border. Over the next six months they joined the network led by Albert Guérisse, that helped British airman shot down over France to escape back to Britain. In December 1940 the network was betrayed Borrel and Dufour were forced to abandon the villa and hid in Toulouse. Eventually they escaped to Portugal where Borrel went to work at the Free French Propaganda Office at the British Embassy in Lisbon. Borrel stayed in Portugal until April 1942 when she travelled to London. On her arrival Borrel was taken to the Royal Patriotic School where she was interrogated in case she was a double agent. Although she was known to have strong socialist views she was recruited by the Special Operations Executive (SOE) as a British special agent. Given the code name "Denise", Borrel and Lise de Baissac, became the first women agents to be was parachuted into France on 24th September 1942. They landed in the village of Boisrenard close to the town of Mer. After staying with the French Resistance for a couple of days Baissac moved to Poiters to start a new network whereas Borrel went to Paris to join the new Prosper Network that was to be led by Francis Suttill and included Jack Agazarian and Gilbert Norman. Suttill was impressed with Borrel and despite her young age in March 1943 became second in command of the network. He told the Special Operations Executive in London that she "has a perfect understanding of security and an imperturbable calmness." He added: "Thank you very much for having sent her to me." On 23rd June, 1943, the three key members of the Prosper Network, Borrel, Francis Suttill and Gilbert Norman, were arrested. Borrel was taken to Avenue Foch, the Gestapo headquarters, in Paris. After being interrogated she was sent to Fresnes Prison. On 13th May 1944 the Germans transported Borrel and seven other SOE agents, Vera Leigh, Diana Rowden, Sonya Olschanezky, Yolande Beekman, Eliane Plewman, Madeleine Damerment and Odette Sansom, to Nazi Germany. On 6th July 1944, Borrel along with Vera Leigh, Diana Rowden and Sonya Olschanezky, were taken to the Concentration Camp at Natzweiler. Later that day they were injected with phenol and put in the crematorium furnace. (1) Captain Selwyn Jepson was SOE's senior recruiting officer. He was interviewed by the Imperial War Museum for its Sound Archive. (2) Lise de Baissac, who parachuted into France with Andrée Borrel, was interviewed by Rita Kramer for her book Flames in the Field, in 1988. As it happens, we went twice. The pilot wouldn't drop us the first time because the lights on the landing field were not quite accurate, so we had to come all the way back, which was very trying. You were squashed in that little plane with a parachute on your back and your legs drawn up, and, of course, there was the danger too. Back in England they told us the reception committee had a man missing and so they couldn't place the lights for the signal the way they were supposed to. We went back again the next night. We sat on the floor in the airplane, much too tense for conversation, which in any case was not possible because of the noise. I don't remember how long it was until the dispatcher opened the hole, which meant we were arriving. We crept nearer, getting our legs into position. We had drawn straws and luck gave Andree the first jump. I went immediately after her. You had to jump very quickly, one right after the other, because the plane is going on and you might be dropped very far from each other. We didn't have to bury our parachutes or carry things or do anything. They did it all for us. There was very little talk, only what was essential. They took us in the moonlight to a shed in the woods nearby and we spent the rest of the night there. When the curfew ended in the morning they brought round a horse and cart and we climbed onto it and Culioli took us to the the place it had been arranged for us to stay for the next few days. Andrée Borrel had been in France after the occupation started, but to me it was all new. I had never seen a German uniform, only the pictures they had shown us. The old people told us a lot of little things about everyday life, the regulations about identity cards, how to use ration tickets for food and clothes, which days different things were allowed or forbidden. We went out to look at the people, the different German uniforms. We went to the station to see the crowded trains and how they worked. was the only thing I knew about her life before. She never mentioned her sister or her parents. I only knew her by her code name of Denise. But during those few days I appreciated her manner, her character. She was quick, determined, ready to face any situation. I liked her. She (Andrée Borrel) has a perfect understanding of security and an imperturbable calmness. Everyone who has come into contact with her in her work agrees with myself that she is the best of us all. Thank you very much for having sent her to me. (4) Madame Guepin, a member of the Prosper Network, wrote about Andrée Borrel after the war. She was capable. She had a head on her shoulders and a will of iron. She was utter loyal and devoted to Francis Suttill, as her chief. 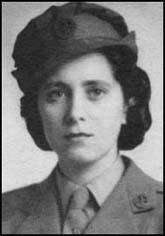 courier, Andrée Borrel, who was the first woman agent of SOE to be parachuted into France and who, like Nancy Wake, had already had experience of helping escaped prisoners. (6) On 13th May 1944, Odette Sansom was moved by the Gestapo from France to Germany with Andrée Borrel, Diana Rowden, Vera Leigh, Yolande Beckman, Madeleine Damerment, Elaine Flewman and Sonya Olschanezky. 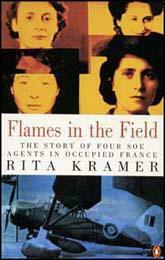 She was interviewed about these experiences by Rita Kramer for her book Flames in the Field. people sitting on the terraces of cafes drinking their ersatz coffee or whatever. I was looking forward to the trip. I had spent a year alone in my cell and I thought. Now I am going to be with these other women. (7) Brian Stonehouse was at the concentration camp at Natzweiler when Andrée Borrel, Diana Rowden, Vera Leigh and Sonya Olschanezky arrived on 6th April 1944. He described her in a statement he made to a military court in 1946. There was one tall girl (Andrée Borel) with very fair heavy hair. I could see that it was not its natural colour as the roots of her hair were dark. She was wearing a black coat, French wooden-soled shoes and was carrying a fur coat on her arm. Another girl (Sonya Olschanezky) had very black oily hair, and wore stockings, aged about twenty to twenty-five years, was short and was wearing a tweed coat and skirt. A third girl (Diana Rowden) was middle height, rather stocky, with shortish fair hair tied with a multi-coloured ribbon, aged about twenty-eight. She was wearing a grey flannel short 'finger tip' length swagger coat with a grey skirt which I remember thinking looked very English. The fourth woman (Vera Leigh) of the party was wearing a brownish tweed coat and skirt. She was more petite than the blonde in grey and older, having shortish brown hair. None of the four women were wearing make-up and all were looking pale and tired. (8) Franz Berg, was a stoker a the Natzweiler Crematorium Furnace. He testified against Peter Straub, the camp executioner, during his trial in 1946. Peter Straub told me to have the crematorium oven heated to its maximum by nine-thirty and then to disappear. He told me also that the doctor was going to come down and give some injections. I knew what this meant. At nine-thirty that night I was still stoking the fire of the crematorium oven when Peter Straub came in, followed by the SS doctor, who had come with Hartjenstein (the camp commandant) from Auschwitz. I saw the four women going to the crematorium, one after another. One went, and two or three minutes later another went. The next morning the German prisoner in charge of the crematorium explained to me that each time the door of the oven was opened the flames came out of the chimney and that meant a body had been put in the oven. I saw the flames four times. (9) A prisoner at Natzweiler overheard the killing of Andrée Borrel, Diana Rowden, Vera Leigh, and Sonya Olschanezky and later told what he heard. They were bringing a woman along the corridor. We heard low voices in the next room and then the noise of a body being dragged along the floor, and he whispered to me that he could see people dragging something on the floor which was below his angle of vision through the fanlight. At the same time that the body was brought past we heard the noise of heavy breathing and low groaning combined. Again and again we heard the same noises and regular groans as the insensible women were dragged away. The fourth, however, resisted in the corridor. I heard her say Tourquoi?' and I heard a voice which I recognized as that of the doctor who was in civilian clothes say 'Pour typhus.' We then heard the noise of a struggle and the muffled cries of the woman. I assumed that someone held a hand over her mouth. I heard this woman being dragged away too. She was groaning louder than the others. From the noise of the crematorium oven doors which I heard, I can state definitely that in each case the groaning women were placed immediately in the crematorium oven. When (the officials) had gone, we went to the crematorium oven, opened the door and saw that there were four blackened bodies within. Next morning in the course of my duties I had to clear the ashes out of the crematorium oven. I found a pink woman's stocking garter on the floor near the oven. (10) Peter Straub, the camp executioner, later told Walter Schultz, about the killing of the four women. He was very drunk on that day, and I put a direct question to him as to what had happened to the women, because on the next morning it was talked about in the camp that they were dead, and Straub told me that he had been for a long time in Auschwitz but had never seen such a thing before; he just said, "I am finished". The women were told to undress in front of the doctor. They refused. Then it was said that they were going to be inoculated and they asked why, and then it was said it was against typhus, and then they laid bare their arms and were inoculated. They were taken singly into the room where they were inoculated, and they were taken back singly to where they had come from. As the second was taken back to the place, the first one was already in a kind of stupor. He said they were finished. They were stiff, but the word "dead" was not mentioned. The fourth woman as she was being put into the oven regained consciousness. He showed me a few scratches on his face and said, "There, you can see how she scratched me. Look how she defended herself." (11) (11) Hartley Shawcross attended the trial of the men charged with killing Andrée Borrel, Diana Rowden, Vera Leigh and Sonya Olschanezky.